2 Why Use Patio Furniture Indoors? 6 Conclusion: Use Your Patio Furniture Indoors! When it comes time to close up the patio area for the season, many who love their outdoor furniture are faced with a problem: what to do with it! Of course, the most obvious move is to simply cover everything or move it into a garage or storage area for shelter from the winter. What many don’t consider is how to use patio furniture indoors! These pieces can serve the same purpose as regular indoor furniture and can be quite useful in a variety of circumstances. This article looks at a few ideas for how to incorporate patio furniture into the interior of your home when the season ends, and also considers a few choices for indoor-outdoor furniture. If you plan ahead when purchasing your patio furniture, you can seamlessly integrate much of it into the interior when the time is appropriate. At the end of the article, we’ll give a few recommendations for furniture pieces that can work great indoors and outdoors. Why Use Patio Furniture Indoors? Many types of furniture are quite costly, whether it is indoor furniture or outdoor furniture. Patio furniture can be a big investment, and if only used during the warmer months of the year, the cost can seem even more of a barrier. This often means you’re spending your money inefficiently, and storing the furniture away could mean it becomes a new home for an animal trying to escape the cold weather or a mildew-filled pile of yuck. Many outdoor furniture pieces look similar to regular indoor pieces, through patio sets are often designed with different materials and are more durable. They’re meant to survive outdoors, after all! But don’t just think that patio furniture should only be used indoors during the winter. In fact, you can use patio furniture indoors all the time, or bring items in and out as needed. If you have multiple living spaces inside (say, a living room and a family room, or a den and a rec room), you could consider furnishing one of these rooms with traditional indoor furniture and making the other a “flex” space. In the winter months, move your patio furniture into your “flex space”, be it a den or rec room, and use it there over the winter months. In the summer months, use bean bag chairs and similar flexible, casual seating in the den area, while your patio set sits outside in its glory. This means you won’t need to purchase excess furniture, only to store it in the cold months. Your furniture is doing double duty. Patio furniture is designed to be comfortable and tends to be less stiff and formal like many indoor pieces. If comfort is your biggest concern, using patio furniture indoors is a good solution. These pieces also tend to be a bit more casual than many indoor furniture sets. Patio furniture is often quite lightweight, making it easy for you to move it around. Of course, that solid teak living set won’t be lightweight, but many sectional sets and outdoor wicker sets are light-weight and easily-configurable. This means you can easily rearrange the pieces without exerting much energy, and you can move them around easily, as needed. Patio furniture is often made with interesting pops of color and style, more-so than most indoor furniture. These pieces can really look striking inside, though you should use these color pops sparingly. This outdoor chair by Phi Villa is a great example of how elegant and classic outdoor furniture can be. Includes: 1 x Sofa (Size: L26" x W29" x H28"). Fits in outdoor, patio, living-room, bedroom. it makes a great reading seat, ideal for relaxing. Another great benefit about using patio furniture indoors is that it can take up less space. Patio sets are often not as bulky as indoor furniture and, are designed to be compact. By placing a few patio pieces inside, you can add more furniture to a room or help the area look more open because it won’t be crowded with large pieces of furniture. Of course, if you already have a lot of furniture in a room, be careful not to add too much more furniture to make it feel cluttered! For example, there are many who love to forego a bed altogether and use a hammock for sleeping indoors. When the hammock isn’t being used, it can be folded away, and the entire space of the room can be used for other things. Patio furniture is super tough and is designed to handle constant sun, wind, rain, and the like. These sets are usually treated for stain-protection and are built with fabrics like Sunbrella fabric, our favorite outdoor fabric. These fabrics are particularly robust and are a great choice for those dens and kid’s playrooms where furniture often gets beaten up. Modern-style outdoor furniture is often quite low to the ground in general, which makes it easier for kids to get on and off. Many outdoor dining tables, especially teak tables, can be surprisingly beefy and solid — easily as solid as most indoor dining tables. And for those who have formal dining rooms that only get used on the major holidays that fall on the cold months like Thanksgiving, Christmas, Easter, Hannukah, etc., having an indoor/outdoor dining set in that space is often perfect. Of course, teak outdoor chairs may feel too heavy for an indoor dining room, and you may want to swap those chairs out for something a little bit more appropriate for indoors. For ideas on teak dining sets, see here. Many indoor furniture designs are often quite expensive, especially for those who are looking to furnish rooms that aren’t primary living areas. Despite this cost, the furniture often looks quite similar to patio furniture pieces, and aren’t as durable. This makes using patio furniture indoors an affordable option because you can find stylish and durable pieces at a low price. And patio furniture can often last many years if properly taken care of. If you’re interested in learning more about how you can use these pieces indoors, you’ll find some helpful tips below. Before you bring your patio furniture inside, give it a good wipe-down, and thoroughly clean it. Turn the chairs over and clean the bottom of the legs, or if it’s a sectional set, check the bottom area for cobwebs, insect infestations, and the like. You want to bring the outside furniture in, but you don’t want to bring in any pests! Patio carpets tend to be much more durable thank indoor carpets because they use stronger fabric strands compared to indoor carpeting. Of course, they don’t feel as nice on your feet like a beautiful wool Oriental rug, but outdoor carpets can absolutely be used indoors, especially in places where you want ease of cleaning and robustness. Dash and Albert carpets have a great line of polypropylene Indoor/Outdoor rugs with cool styles and super-robust designs. These carpets, available on Wayfair, can be cleaned by simply hosing them off, and they look really nice. We often take our Dash and Albert indoor/outdoor carpet in and use it inside during the cold months, and it’s an ideal rug for the kitchen or around the dining area. These areas often get foods and drinks spilled on them that can be a pain to clean up, and the rugs look amazing. The resin-wicker material commonly used in patio sofa sets, sectional sets, and the like is almost always made from a recycled plastic material, made to look like traditional rattan wicker. This material is very eco-friendly, which is always a nice feature, both in indoor furniture and in outdoor furniture! You don’t have to stick to layouts that you would use outdoors when you bring your patio furniture into your home. Use your imagination and be creative with your design. These items often let you be a little more creative compared to indoor furniture which can be heavy to move around and not always as stylish. You can blend a few indoor/outdoor pieces into a room with regular indoor furniture, but if you try to put too much into a living space, it will look awkward. 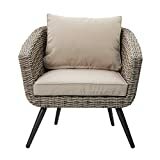 When many think of wicker furniture they think of sunrooms and patios filled with wicker rocking chairs or benches. While wicker is a popular design to use outdoors, it can work just as well indoors. It can create a unique elegance for the room and is also pretty comfortable to sit in. In addition to this, wicker can be found in a variety of colors so it can match the room’s color scheme perfectly. In this section, we’ll highlight several of our favorite furniture pieces that are easy to move indoors and outdoors, as needed. We already talked about indoor-outdoor chairs above, but the Acapulco chair deserves special mention. It’s a great stylish, versatile chair that can work both beautifully indoors and outdoors, and is both comfortable and ultra modern. There are several companies that make replicas of this classic mod chair, including Innit Designs Acapulco Chair. Getting an original is difficult and probably unwise, as the replicas are much more capable of handling life outdoors. As there’s no clear original designer for this chair, there’s no “official” version to buy. There are many versions of the modern-style resin-wicker patio sectional set available. These units are usually constructed of PE-wicker, though occasionally of the stronger HDPE-wicker. These sets are usually pretty low to the ground and are super configurable. They’re also ideal indoor/outdoor pieces, as they’re almost always very easy to move, and can look great anywhere, especially in casual areas like rec rooms and playrooms. You can find more about sectional sets here, from budget-priced sets like the UMax to the Modenzi line of sectionals to the Ohana line. And at the high end, there’s always Harmonia Living’s pieces, one of our favorite brands of patio furniture! Hanging Egg Chairs can make a great statement outdoors, or in a quiet nook. These chairs create inviting places to sit and relax and read a book, or perhaps nap a bit. For more information on hanging egg chairs see our article here. Bean Bag Chairs are staples of dens, kids rooms, and game rooms. With modern fabrics and clever design, they can live outside, as well! A few manufacturers are blending the bean bag design with outdoor fabrics that allow these chairs to get wet without getting damaged, and they look great! For more outdoor beanbag chair ideas, see here. Like the egg chairs mentioned above, hammock chairs can work great both outdoors and indoors. If you have a hammock suspension hook both inside and outside, it can be very easy to move the chair to your relaxation space, wherever that may be! Here is more information on swinging hammock chairs. Ceramic Garden Stools are becoming more and more popular in design magazines and in the usual online areas where home furnishings are promoted. These stools can work great as side tables, plant stands, occasional seats, ottomans, etc. For ideas on these stools, see our Ceramic Garden Stools article. Metal garden stools are very similar and tend to be a little bit lighter weight, so they’re easier to move around. They also often come in fun colors! For metal garden stool inspiration, see here. Conclusion: Use Your Patio Furniture Indoors! By getting creative with your patio furniture, you can pick pieces that will work in your space, both indoors and outdoors! This can save money and allow you to make more dynamic rooms and environments. With some forethought when purchasing outdoor furniture, you can have multi-function spaces that change over the course of the seasons, resulting in an always-fresh design, both indoors and outdoors! And you can even save money by efficiently using your furniture in creative ways.